Normally, when you tour a brewery it goes something like this. You begin either with the malt storage or the brew house, admiring the assorted shiny vessels used in preparing and boiling the wort (the “hot side”). Then you move to the “cold side,” where the beer is fermented and conditioned, sometimes deep under the ground. In small breweries with no packaging lines, you might stop there, but if a brewery has one, you will definitely move on to that. Without fail, brewers are proud of their bottling systems, because this is the most expensive piece of equipment and also the one with the most engineering wizardry. If you happen to be touring a brewery in Germany, England, or the U.S., your tour ends there. At ale breweries in Belgium, however, you have one more stop. 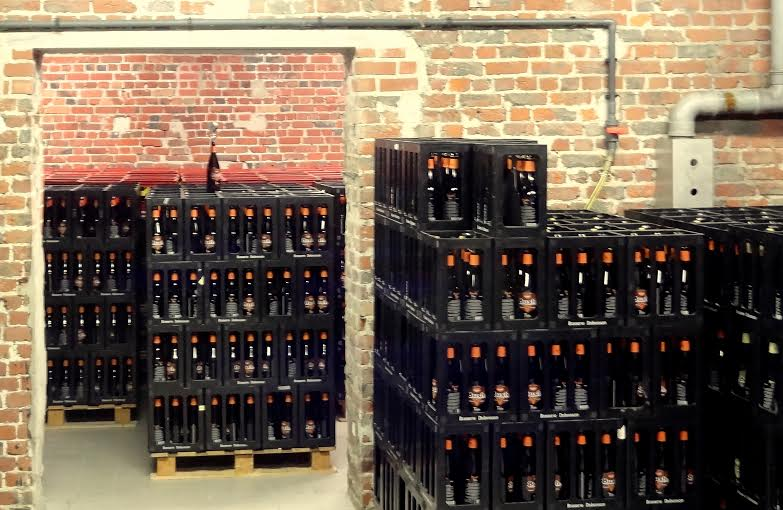 After they’re bottled, Belgian beers are stacked on pallets and wheeled into a very special storage unit called a “warm room.” Here the beer goes through a final fermentation in the bottle. Americans sometimes refer to this as “bottle conditioning,” but that misses the point—and Belgians never use that phrase. They generally call it “re-fermentation” or “secondary fermentation.” The difference is more philosophical than biochemical. Belgian ales constitute the most diverse range of beers of any European tradition, running the gamut from low-alcohol table beers to booming abbey ales, from pale to dark, spiced, fruited, and sugared to stripped down and simple—and including all manner of funky and wild ales. What they all have in common is an emphasis on flavors produced during fermentation. Even in superficially unassuming pales ales, you will find a complex blend of fruity and spicy flavors that come from compounds produced during fermentation. Breweries have their own house yeasts which give their beers a unique flavor signature composed of these compounds. And here’s the most interesting part: Belgians don’t believe those flavors can be created to the appropriate level of complexity after one fermentation. They need to go through a secondary fermentation in the bottle to fully develop those flavors. And this isn’t true of just some of the beer styles; strong golden ales, abbey ales, lambics, saisons—they all head to a warm room. Nowhere did I find this more strikingly illustrated than at Brasserie Dupont, famous for the exotic yeast strain that powers its saisons. After bottling, Dupont’s beer doesn’t just go to the warm room. First, each bottle must be laid on its side. Why? Master brewer Olivier DeDeycker explained it. “It’s mostly important for us to initiate secondary fermentation in this way. If we start the secondary fermentation like so [he made the gesture of an upright bottle], we have a totally different beer. The yeast multiplies very differently. We made different trials, and the conclusion was that we need to continue like this.” Yeast is a living ingredient, and it behaves differently in different environments. Upright bottles sent to the warm room made listless saisons, he told me. Temperature is another issue. Though they are called warm rooms, some are kept relatively cool. Orval re-ferments at 59˚ F. Orval uses a mixed strain of regular ale yeast and wild Brettanomyces, and the cooler re-fermentation temperatures allow the latter to develop more slowly. Other breweries might have warm rooms set to the low- or mid-70s. The warmer the room, the more character the yeast will develop during re-fermentation. Travelers to Belgium may have noticed that draft beer is nowhere near as emphasized in pubs or cafes as it is in similar venues elsewhere. A typical Belgian café may have two or three taps (or none) and dozens of bottles available. Breweries that keg their beer do it only in small quantities. The reason has to do with re-fermentation: a kegged version of a brewery’s beer will just have less character than a bottle-conditioned one. Many breweries don’t even bother to keg any of their beer. Bottle-conditioning has two additional benefits, one of the beer and one for American consumers. When beer re-ferments in the bottle, the yeasts consume oxygen as they multiply and gobble sugars. Since oxygen is the enemy of beer—it causes staling, which dulls the flavors—bottle-conditioned beer’s flavors remain stable longer. And, because Belgians bottle most of their ales, that means it’s easier to ship them across the Atlantic to the U.S. where, because they’ve been bottle-conditioned, they are more likely to taste like the brewery intended. It’s always easy to tell a beer that has been re-fermented in the bottle. Look for a skiff of snowy material on the bottom of the bottle. Those are the yeast cells, resting after their hard work. Now, doesn’t this all make you want to go buy a bottle of Belgian ale? For more “quirks of brewing” posts, have a look at parti-gyle brewing, ferulic acid rests, and decoction mashing. I am a home brewer, particularly of Belgian style beers. Such an important concept for American craft beer fans to understand. Awesome article. Thanks for putting this together! Greatly appreciate your article. Makes me want to travel to Belgium to experience it first hand. Until then, I’ll grab a bottle or two from my local bottle shop. Cheers!